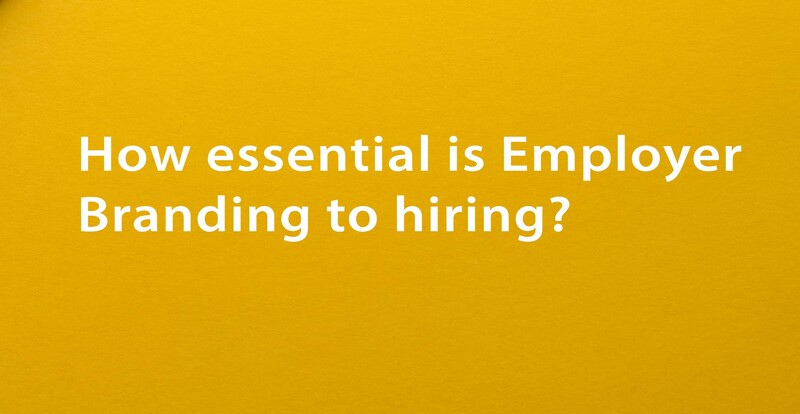 How essential is employer branding to hiring? Are you attracting the right number of right talent to your company? Are you facing troubles poaching credible passive candidates? Is your company investing in additional expenses to attract candidates? If, yes! Then this blog will help you as a recruiter to make the best hiring decision. The root of your company failing to attract credible talent is poor employer branding. We all know that employees are a greatest asset to any company but what is the use if they aren’t projected as key players in the industry. Before delving into the how your company can brand employees for better prospects, let us understand employer branding as a whole. Employer branding is the process in which employees are recognised by the company for their efforts, contribution and the value they bring to the management they bring to the management as whole. In this day and age, employer branding is used as recruitment strategy to attract current and future employees. Many companies brand their employees to attract a specific target group. It is not new when you come across top women employee or director profiles trending on social media or their personal websites. This process enables the company’s ability in retaining and luring potential candidates. It positions your company as the “best place to work” in the industry as it highlights the fact that your company recognises employees for their hard work. Branding of staff while recruiting will eradicate any pre-conceived notions about the company and increase applicant traffic to the company. Employer branding influences people to join your company. Be it active or passive, employee branding helps talent to at least enquire about the job and compels them to apply for the same. It is considered a good strategy for social media hiring as youngsters these days get highly influenced by company ads pertaining to work culture and employees. Employer branding not only gets you the right talent but also fetches a good amount of goodwill through external and internal public. Despite the many benefits listed in hiring and other business solutions from employer branding, companies are still averse to implementing it and perhaps some don’t even know how to get employer branding done. Employer branding is relatively easier when a company scans through its own strengths and opportunities. But here is why a company should engage into the employer branding process. Engaging employees in Corporate Social Responsibility (CSR) can enable an organisation to get the desired outcome. It’s a great way to brand employees. Likewise, companies get a chance to showcase their vision, mission and values in the most succinct and distinct way. Whether it be fund raising campaigns or environmental campaigns or even offering jobs to fresh talent, almost every CSR activity is a great step to rise high in the eyes of external public – who are stakeholders and potential job applicants. To reduce attrition in any organisation, it is essential that employees are kept engaged throughout their tenure at work. Employee engagement is an activity the HR department of every organisation is taking seriously. One of the best ways to keep employees engaged is to simply promote them by recognising their efforts and contribution to the organisation. This consideration by the company will boost their morale and enforce to perform even better, subsequently earning a good return in the future. Without second party entities, a company will cease to exist. At times lead generation and other traditional marketing activities just don’t seem to work while getting the best clients. This might heavily affect the productivity and halt the progress of the company. Thus, to put an end to this situation, a company can brand their employees while projecting their efforts to another party. This action will paint a good picture about the company into the minds of the client, hence triggering their interest levels to engage further. With strategies in favour of employees, work environment will naturally be vibrant and motivating. Employer branding has the ability to promote an element of positivity in the work environment in which exiting employees are happy and willing to voluntarily execute crucial tasks. If you are looking for dynamism at workplace and team integrity, employer branding is the way ahead. Many organisations are learning the art and science of retaining their employees and it is a must for a struggling organisation to follow the same. Employer branding is a great hiring too, it enables potential candidates to build a personal connection with the company employees, get influenced and apparently relate to them. For some candidates, employee branding is close to adulation, while a good opportunity for recruiters to hire the best and suitable talent.